Unit price According to Regulation No 31/1995 Sb. Product description The INSPIRE Elevation TIN data are harmonised according to INSPIRE Implementing Rules. This dataset of the elevation of the Czech Republic therefore has the unified design with other data created for this INSPIRE theme in frame of whole Europe. Data were derived from the Digital Terrain Model of the Czech Republic – 5th generation (DMR 5G). For compliance with the data specification data were transformed to coordinate reference system ETRS89-TM33N and ETRS89-TM34N and heigh reference system EVRS. 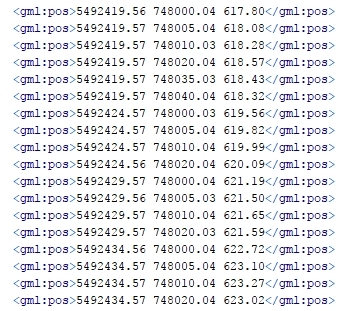 Data are provided in GML format, version 3.2.1. Export units are defined by the grid SM5. The file consists mainly from coordinates of descrete points, that are supplemented by addtition information. For the entire Czech Republic data are provided in ETRS89-TM33N coordinate system, for the east territory (from 17° longitude) data are provided in ETRS89-TM34N coordinate system on request. Access restriction - licence agreement and other restriction According to Regulation No 31/1995 Sb.